To prepare the dressing, whisk together the vinegar, lemon juice and garlic. Then, add the basil and slowly whisk in the oil until the dressing is smooth. Season with salt and pepper to taste (about 1/4 tsp salt and 1/2 tsp pepper). Heat some oil in a large sauté pan over medium heat, then add the asparagus, zucchini and onion and sauté until soft (about 5 minutes). Add the roasted red pepper and tomatoes and sauté until heated (about 2 minutes). In a separate pan, season (with salt and pepper) and sear the Mahi Mahi over medium-high heat until cooked through (about 3 minutes per side). 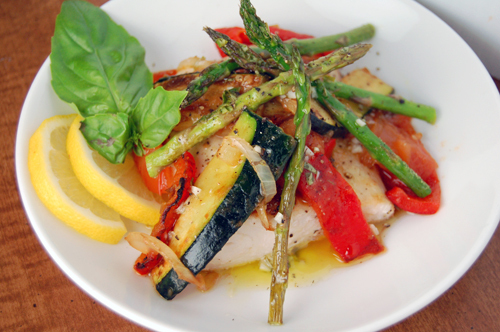 To serve, place one filet of fish on each plate, cover with the vegetable medley, and drizzle with lemon basil vinaigrette. I don’t often cook fish, but I might give this one a try. Thanks! Your fish and vegetables look delicious. I’m not a huge fish eater but if I can pair it with something tasty, I’m able to eat it right up! Lovely blog you’ve got here. Got your msg at Foodbuzz. Sorry it took a while to drop by. Do follow my blog @ Luxury Indulgence & looking fwd to your comments too 🙂 Have a good week ahead! 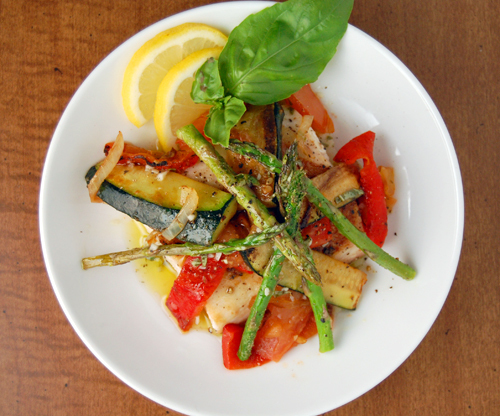 I love the mahi mahi combination with the taste of asparagus; two tastes that work very well together … congrats on your healthier choices… btw if you like asparagus, check out my soup and tell me what you think. I’m heading to the farmers market right now to get the ingredients for this salad, it’s beautiful! Love the photo shot from above! Very nice! This is my kind of recipe. I cook healthy all the time too, but a chorizo and cheese taco now and then is the bomb! You just inspired me! I have all of those vegetables sitting in my fridge and am actually thawing out a fish fillet right now. Didn’t know how or what I was going to create until now. Thanks! Divine! This looks so delicious! Oh my gosh, this looks incredible! My mouth is watering. Great photos–so colorful.